A convicted criminal and an international fugitive — a man who had reportedly stolen $24 million from a company in France — was working at the JACCC for the last seven months, according to accounts that became public on Aug. 21. Through Rafu‘s fact-based and comprehensive coverage a day or two later, we were able to learn who Greg Willis is and some of what happened. 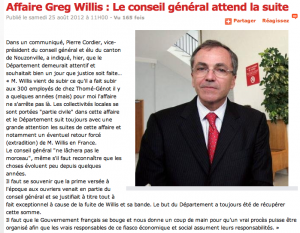 French newspaper article about the possibility of extraditing Greg Willis. But since the departure of Willis, JACCC Board Chair Sandy Sakamoto and her inner circle of advisors have made no public statement about this scandalous turn of events and how it happened. At the time of Willis’ hiring in January, Sakamoto was gushing in praise of the new CEO as having an “impressive range of multi-sector professional experience in Japanese, American and international business settings” and a “unique mix of vision, business and management acumen and proven leadership success.” She sounded triumphant. Then a few months into Willis’ tenure, when someone alerted Sakamoto about Willis’ abusive management style and mistreatment of staff, she issued a terse statement saying it is a “personnel matter.” She even admonished the community to be quiet because “public discussion, media and social networking … could interfere with” what Willis was doing at JACCC. What a difference seven months make. Now that Greg Willis fled (or in Sakamoto’s words, “resigned for personal reasons”), her inner circle has become the focus of attention again. People — long-time supporters of the JACCC among them — are asking: Were the JACCC caretakers negligent in hiring a criminal, and did they breach their fiduciary duties in allowing him to stick around after it became known that he was a crook? In place of the grandiose statements of January, there is a bewildering silence on the part of the JACCC insiders. Have they invoked the Fifth Amendment? Is it just “On the advice of my counsel, I respectfully decline to answer”? Questions remain unanswered. What happened in the last seven months? Community observers are wondering how a convicted white-collar criminal was hired in the first place. Who was on the nine-member “search committee” that conducted an exhaustive nationwide search? Why were the JACCC’s head-hunters at Johnston and Company unable to uncover a fact that was easily discovered through a simple Google search? Did they not do due diligence in their “in-depth interviews” and “thorough background checks”? When Willis’ abusive treatment of staff was reported to Sakamoto, did she fail to take them seriously or act on complaints in a timely way? Even after Willis’ criminal background was brought to her attention, why were she and her inner circle immobilized for ten days? And why wasn’t the rogue CEO put on immediate suspension or dismissed? Last week, in an effort to squash the story and turn the public scrutiny away from themselves, Sakamoto and other JACCC insiders hired Bill Watanabe, the recently-retired director of Little Tokyo Service Center, to serve as temporary CEO until a permanent president and CEO is found. Is this just cover and a feeble attempt to make things “look respectable”? Do the old-guard insiders really think that the embarrassing, damaging and potentially fatal episode will go away? How many of the nine-member search committee that selected Willis will remain on the next search committee? Will those who were directly responsible have the courage to step forward and the decency to step down? And will the selection for the next CEO be more inclusive and transparent than the last? And finally, will The Rafu Shimpo dig in and find out the truth so the entire community can know what happened?